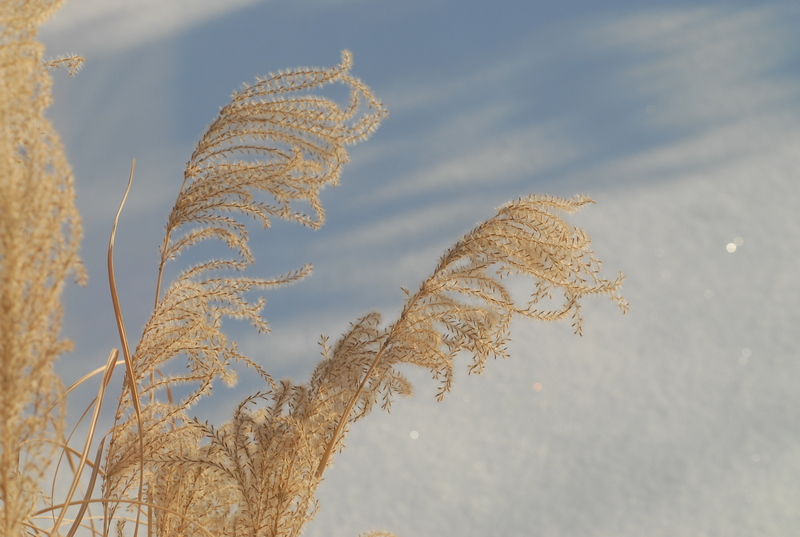 Beauty is where you find it during the short days of Winter. Probably not too many people look forward to December 21, but I do. I look forward to it more than the more popular holidays that occur this time of year. Why December 21? It’s the first day of Winter and we all know what that means. More daylight! December 22 will be slightly longer than its predecessor, and December 23 will be longer than December 22, etc., etc. I know, I know . . . there are still three more months of cold temperatures, and perhaps even many inches of snow. But, those few seconds of increased daylight are worth anticipating and signal that spring cannot be far over the horizon – even though I have to look for it over a big snowdrift. 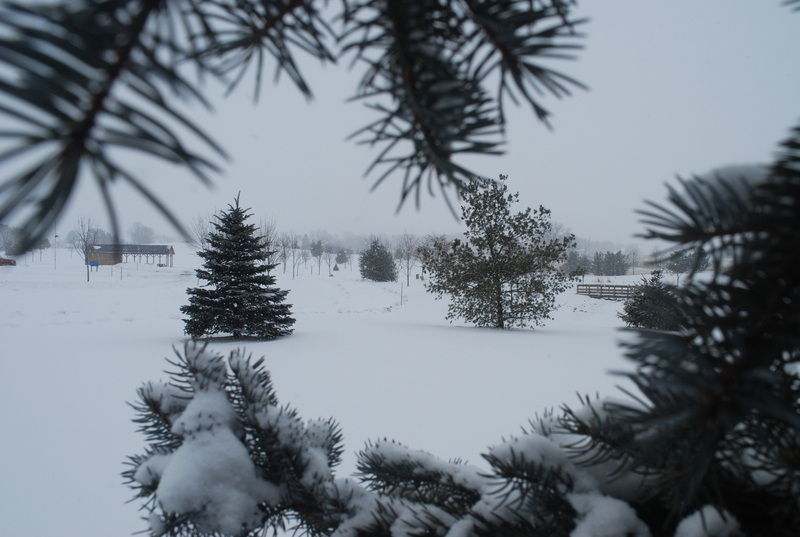 A monochromatic Winter day is still beautiful at Leohr Park. And, think of how much nature you would miss by staying inside. You would miss the crisp air, the soft caress of snowflakes melting on your cheeks, deer gliding through the woods and the occasional chickadee flitting through the crisp air. The first substantial snowfall of the season has made it the perfect time to enjoy a walk along the hike/bike path by Chippewa Creek and through Leohr Park. Be sure to bundle up, find a walking partner and head out. Just think how good that hot mug filled with our favorite beverage will taste when you return home! 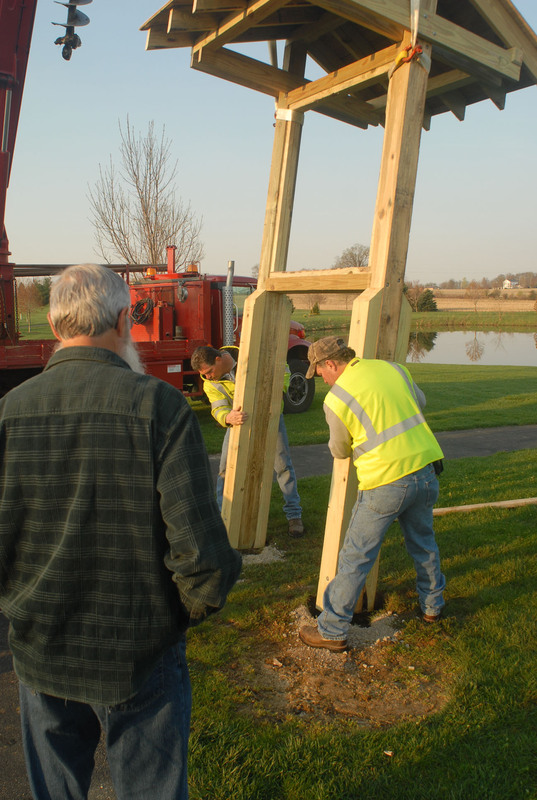 Workers prepare to unload an outdoor bulletin board to be installed at Leohr Park. It is always satisfying when an idea comes to fruition. So many ideas become less grand and slowly fade into distant memory. Not this time. Run For The Trails, Inc. committee member Dave Johnson hatched this idea in late 2009 . He thought designing and building a bulletin board for placement along the trail in Leohr Park would be a great project for when the snow was flying. All the committee members thought it was a great idea; two members, Bob Daniels and Denny Gordon, volunteered to help Dave with the construction. Bob Daniels and Dave Johnson watch as holes as holes are drilled for the bulletin board. Bob liked the design of the bulletin boards used by the Medina County Park system. He was able to obtain the construction plans. Although attractive, those boards were determined to be much too large for our usage. After taking a few photos for reference and a field trip to check out the board at Buckeye Woods, Bob (a former carpenter – thank goodness!) decided to reduce the dimensions by half. A list of lumber, hardware and other parts was compiled. Bob and Dave acquired cost estimates from local lumber companies. Now it was time to find the funds to pay for the project. The bulletin board on its way to its new home. Thank goodness for a Seville Board of Public Affairs post hole digger and crane. Like all projects involving community government, it takes a while to get all things in order. A couple of meetings with the Parks Committee, a visit to the Finance Committee, a conversation with the Mayor and some discussion with village council and we got the go ahead. The pile of lumber in Dave’s driveway was daunting. In our zeal we had decided to construct two bulletin boards. We figured cutting the pieces for two would be just as easy as for one unit. 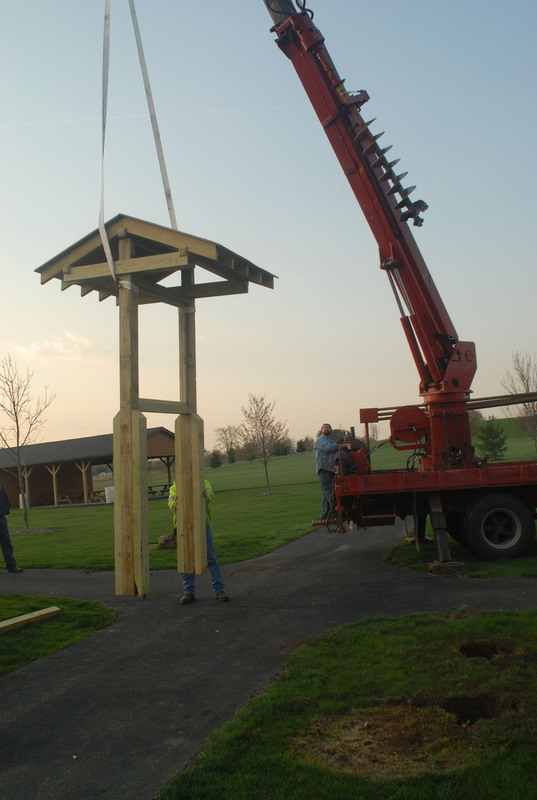 The second bulletin board would be installed at another village park. 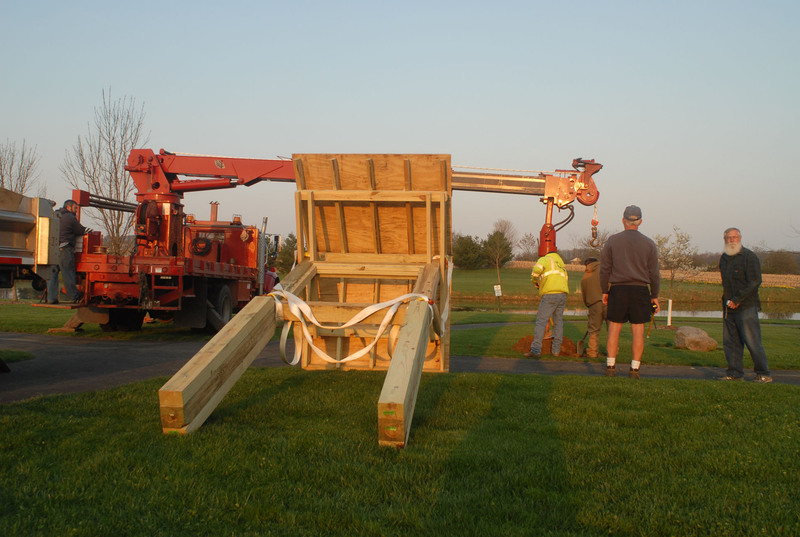 The bulletin board lowered into 5.5-foot deep holes. Crushed limestone later is packed around the legs to make a solid installation. Bob and Dave made the sawdust fly and pretty soon there were two giant – maybe a better word would be gigantic – boards resting in Dave’s driveway. Gosh, maybe we had over-estimated out abilities! Getting those behemoths in the ground was going to be tough. This is where the Good Guys – Board of Public Affairs and Streets Department workers – showed up on the horizon. 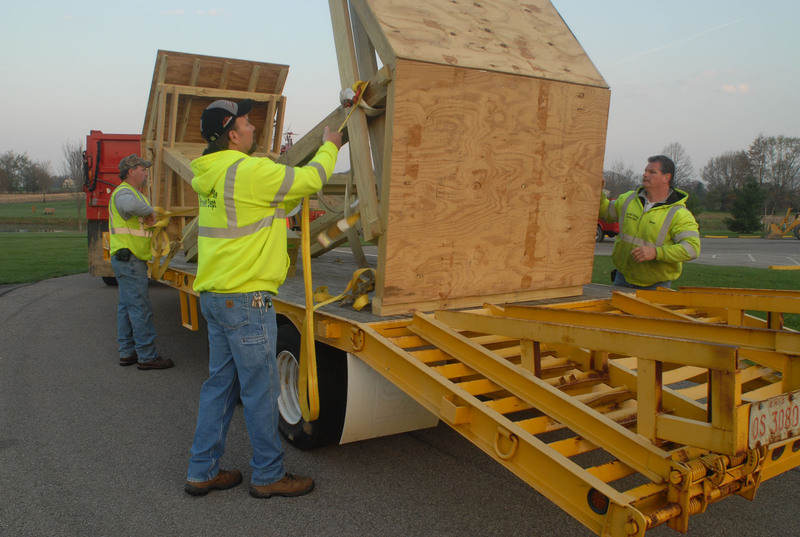 Along with their expertise, they brought a large trailer, a crane, a posthole digger, backhoe and a couple of trucks. They sure made the installation look easy. Dave, Bob and I would still be scratching our heads on how to get the job done. 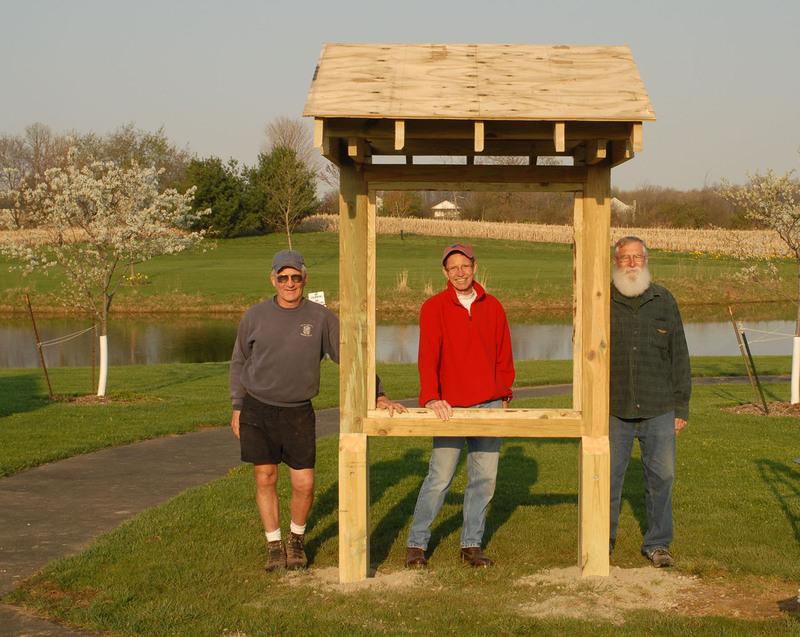 Bob Daniels, Dennis Gordon and Dave Johnson with the new outdoor bulletin board at Leohr Park. There are still several additional steps to completion – glass installation, a locking door, bulletin board material on which to place announcements. I think Dave, Bob and I can handle that by ourselves.